The move comes after a storm last fall caused significant damage to the village fire department and downtown businesses, such as Theatre Three. Port Jefferson is launching an effort to stem worsening flooding that has damaged shops, a theater and a firehouse in the North Shore village formerly known as Drowned Meadow. The village has hired Port Jefferson-based Campani and Schwarting Architects to study recent storms that drenched the downtown tourism and business district and recommend possible remedies. The four-month study, which will cost $9,800, is expected to help the village secure state grants to help pay for future stormwater mitigation improvements. Mayor Margot J. Garant said the study will focus on the harborfront intersection of Main Street and East and West Broadway, and Mill Creek, which runs through Port Jefferson near village hall. The intersection floods during major storms such as nor'easters, and the creek has a culvert that frequently gets clogged with sediment. Flooding in the village is comparatively rare, but six flood events took place last year, Garant said, and some residents said one storm, on Sept. 26, was the worst in recent memory. In that storm, waters rushed down Main Street and caused extensive damage to numerous businesses, including Theatre Three, and the Port Jefferson Fire Department. Fire Commissioner Thomas Totten said the storm hit so fast that firefighters had no time to remove trucks from the firehouse. The truck room floor had 5-1/2 to 6 feet of water, he said, adding a chief’s car was destroyed and the district office was totally flooded. The firehouse sustained about $200,000 worth of damage, all of which was covered by insurance, he said. The department is considering installing flood gates on doors, and weighing a long-term plan to move the firehouse to higher ground. Theatre Three was holding auditions for its annual production of "A Christmas Carol" when water crashed through first-floor offices, artistic associate Douglas Quattrock said. Lighting and sound equipment were destroyed, a boiler had to be replaced, and mementos belonging to executive artistic director Jeffrey Sanzel were lost forever, Quattrock said. 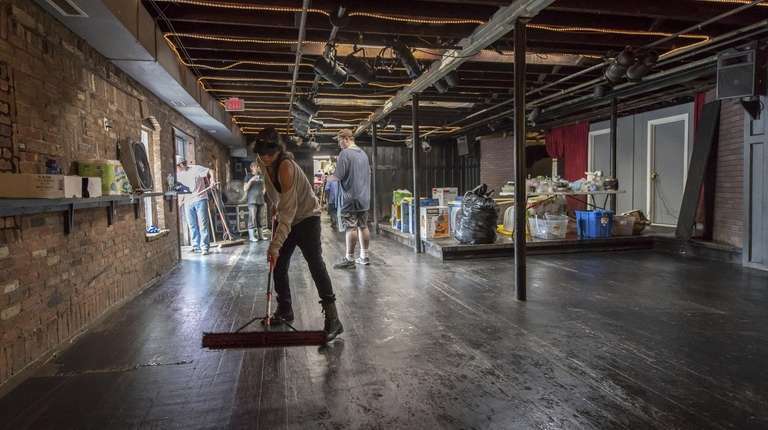 Quattrock said hundreds of volunteers helped clean the theater, and local businesses and other theaters donated equipment to keep Theatre Three open. Garant said the September storm likely was "a freak of nature" that may not happen again. But she wants to take no chances. Main Street/East and West Broadway. Document when and where flooding has occurred at the downtown intersection, and project possible floods there over the next 10 years. Mill Creek. Study stormwater catch basins, a culvert running to the creek past village hall, ponding problems at Barnum Avenue, flooding between Wynn Lane and Maple Place. Harborfront parking lot and boat marina. Work with officials from Brookhaven, which owns and operates the lot and marina, to revise a 2013 Waterfront Revitalization Plan to deal with storm surges and rising tides.